Looking for delicious and healthy dessert ideas to tide you over during the holiday season? What about apple crisp –one of the easiest desserts to make; perfect for both beginner and advanced chefs. 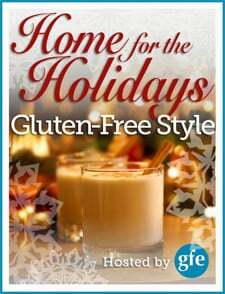 Our Home for the Holidays Gluten-Free Style blogging event offers the comfort, joy, excitement, and fun of the holidays with wonderful recipes from your favorite bloggers. A special thanks to Shirley for including me in the event. If you are in the Fredericksburg, VA area, be sure to check out the gluten intolerance/celiac support group that she runs where they discuss topics such as celiac disease, the gluten free diet and how to survive the holidays. This time of year can be challenging and filled with dietary dilemmas. How do we stay connected to, and feel a part of, the festivities yet remain true to what our bodies need when our visual and olfactory senses are inundated by foods that might not be part of our regular program? If you are on a special diet, this gluten free, grain free Paleo friendly dessert recipe will likely work for you. Further, I like this Gingerbread Apple Crisp because it’s festive enough to bring to a party (or serve to guests in your own home) and also healthy enough for those needing to stay away from certain foods (sugar, gluten and dairy come to mind). For extra holiday flare, serve this apple crisp with the Vegan Coconut Whip recipe in my latest book, Gluten-Free Cupcakes. Are there other substitutions for palm shortening? I love your recipes! Any chance of creating a gingerbread cake recipe? Elana-thank you! I’ve made this recipe honestly at least 10 times now & keep having to buy more ginger so I can make it again! The only change I’ve made is subbing coconut oil for the vegan shortening since I didn’t have any on hand. It always turns out fabulous! Any suggestions for substitutes for almond flour for those of us who are allergic to almonds? I made this for breakfast. Delish! I love your site! Im new to this but love the concept.do you provide nutrition info for your recipes?